As much as I enjoy the occasional pumpkin-flavored treat, the idea of pumpkins as decoration does not thrill me one bit. What is it about pumpkins that deems them the gourd of all gourds? And why must gourds, of all things, be associated with fall decor? And who came up with the strange word “gourd” anyway? Back to the topic at hand: I’ve never been a fan of standard fall decor – or the season in general, to be honest. It’s so very melancholy, with its cooler temperatures, bare, lifeless trees and general bleakness. Must we add insult to injury by filling our homes with artificial, shellacked vegetables? I don’t know why I’m getting so worked up about pumpkins, y’all. If you like ’em, that’s fine. I’m not going to judge you (not too harshly, anyway). 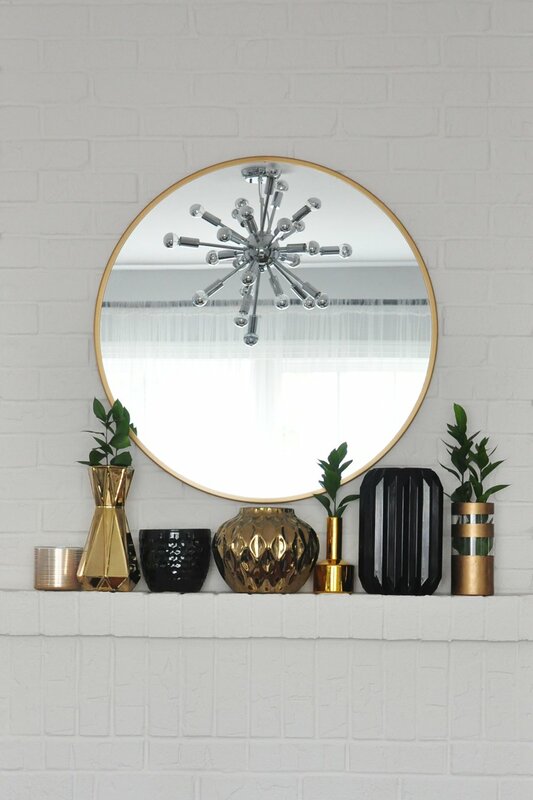 But if you’re looking for something a bit more modern and understated, I’ve partnered with Wayfair to share a few fall decor ideas that are just that. The arrival of cooler temperatures brings about a desire for more intimate, cozy settings in our homes. We crave a comfortable spot to curl up with a good book or to simply lounge away a lazy afternoon (if you don’t have a newborn and can allow yourself that kind of luxury, that is). The side tables in our living room are constantly evolving. Come autumn, they are perfect for holding a few books and a cup of coffee. 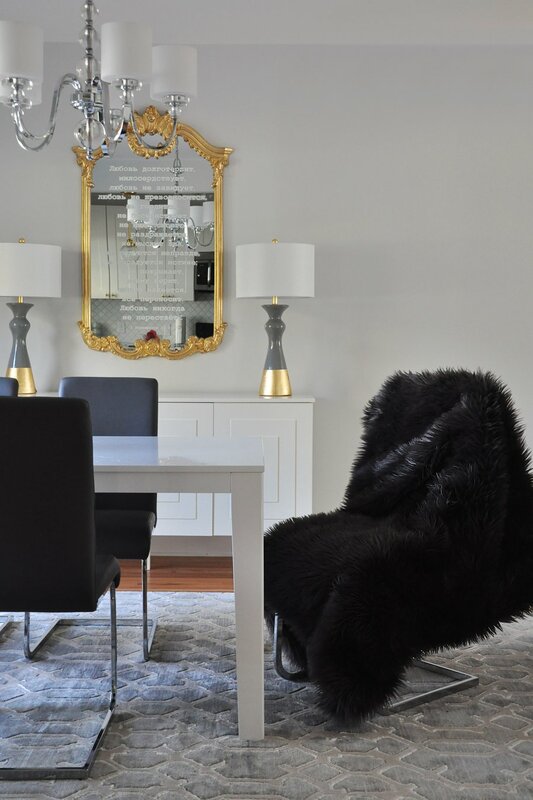 A luxurious, faux fur throw on the sofa practically begs to be felt, making this a very appealing spot to get cozy. Though the floor lamp and cowhide rug are a staple year-round, they add the perfect dose of ambiance to the cozy vignette. A throw is useful practically in every room. Even in a less conventional setting like the dining room it adds texture and warmth. 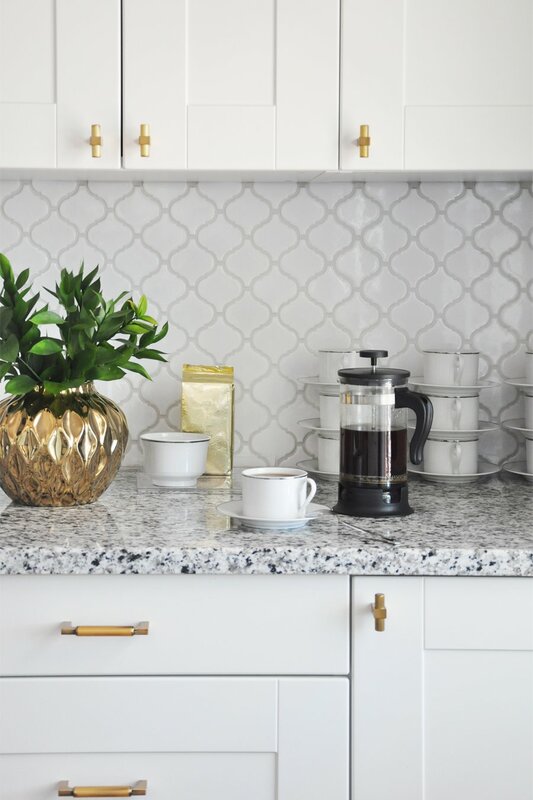 Over in the kitchen, instead of rather useless, decorative tchotchkes, I prefer more functional vignettes – like an always-ready, stocked hot beverage station. Not that my coffee-drinking habits change come fall – they’re quite steady year-round. But a lovely display of coffee-making necessities can add an inviting vibe to the kitchen. If nothing else, having it all on display can serve as a reminder to offer visitors a cup. 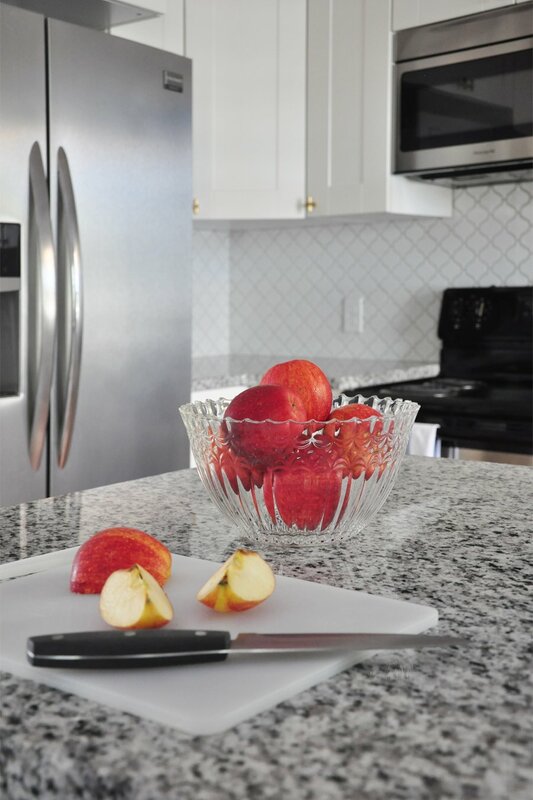 Speaking of the kitchen, I typically prefer to keep my countertops completely empty. However, in the fall I don’t mind leaving out a bowl or three of seasonal fruits or vegetables. It’s a simple way to add a seasonal detail to a space that otherwise may appear quite stark with its white and gray color palette. Speaking of color, instead of the typical palette of orange and brown, I prefer moody, unexpected tones like rich teal. 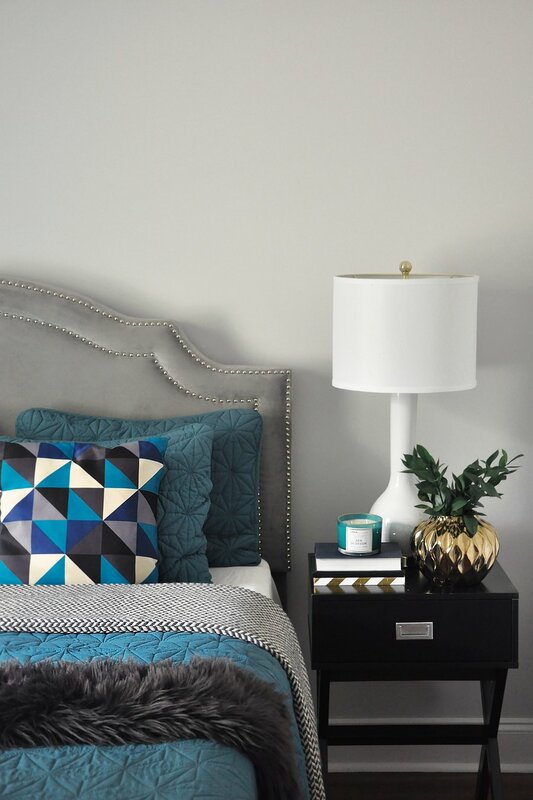 The darker palette created a more intimate setting in our master bedroom, below, making the space perfect for fall. 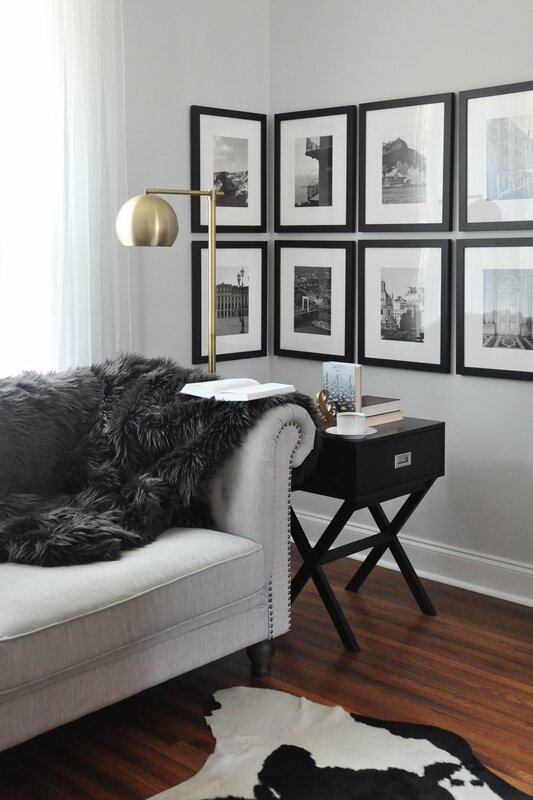 Black decor works equally well if you want more stately, more grounded vignettes but wish to avoid color. In the vignette below, the black vases set a more solemn mood, making the arrangement appropriate for the season. And let’s not forget the candles. If bundling up next to a cozy fireplace is not an option, candles are the next-best alternative. I like to keep things modern with neutral colors and clean, simple shapes. The key is to create a particular mood rather than simply display every candle you own. How do you typically decorate for fall? 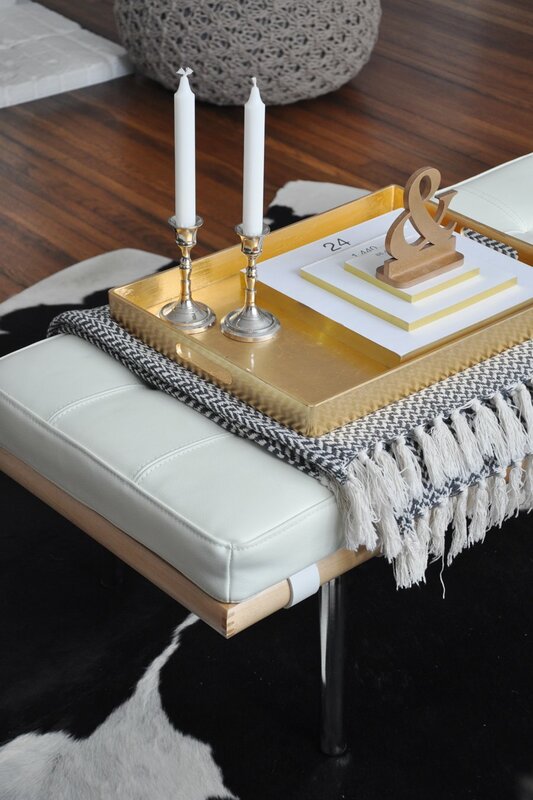 What do you think of my modern and understated take on fall decor? Have I convinced you to forgo pumpkins this year? Please share you decorating plans (or favorite holiday traditions, recipes, anything!) in the comments section below, and be sure to pop over to Wayfair for all of your fall decor needs! This post is brought to you in collaboration with Wayfair. Thanks for supporting the amazing companies that allow me to create unique content while featuring companies I truly love. Posted in HOME DECOR and tagged FIREPLACE, INTERIOR STYLING, KITCHEN, LIVING ROOM, MASTER BEDROOM. I too, am not a fan of pumpkins, gourds, wheat wreaths – any of it! I go for the cozy, more weighted look of darker colors and more throws and pillows. PLUS, those things would not blend with my current style, so it makes no sense to add them. I am a sunshine girl too, so I would have to agree on the ‘bleakness’ of fall – but we might be the minority on that mindset! Haha, you are so right about that! It’s an opinion shared by very few, but oh well!